Three, two, one. . . Happy New Year! Invite everyone to celebrate the new year with one of these festive party invitations that will get them to your bash before the ball falls! When filling out your invitations, don't forget to include any special holiday information. 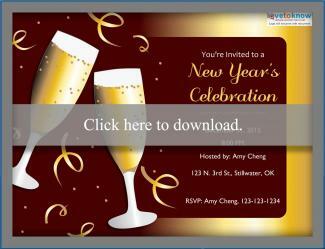 Each of the New Year's Eve party invitations above and below are free for you to download and modify for your party needs. Use Adobe Reader to get them and then add your special party information. The Champagne invitation is best for adults-only parties while the countdown clock invitation will work for any celebration. invys offers a festive New Year's Eve invitation with black and magenta stars. Click on the invitation and then choose whether you want a borderless print or half-page card. Then you can add your party details and even change the colors. While you need an account to print the invitation, any that say "FREE" do not require payment to print at home. Catch My Party has a free blue printable invitation from B. Nute featuring Champagne glasses and a cute poem. Scroll down a couple of pages to find the invitations. If you have problems, the first page of the PDF has helpful downloading and printing tips. End time - While many parties are open-ended, if you don't want to stay up the entire night, include an ending time in your invitation. Designated driver information - Let guests know if you plan to have a couple of designated drivers on hand so they don't need to worry about getting home after the celebration has ended. 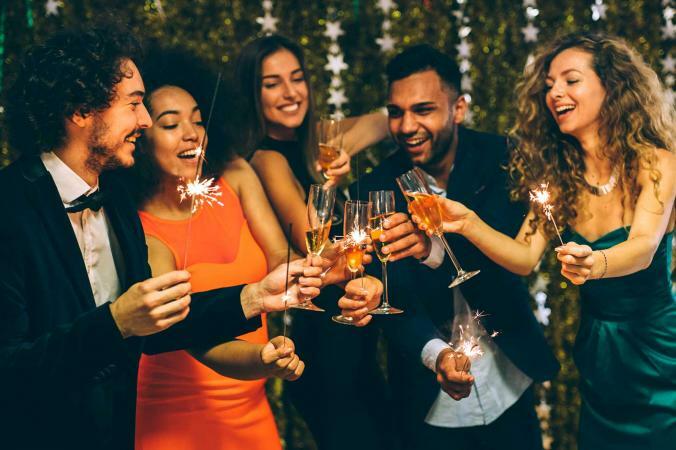 Adults-only or family-friendly - If you plan to throw a rocking bash, let guests know that the party is not going to be suitable for children when you write your wording. The same goes for a family-friendly event - be sure the invitation and wording reflects the idea that you will have children in attendance and lower-key festivities. 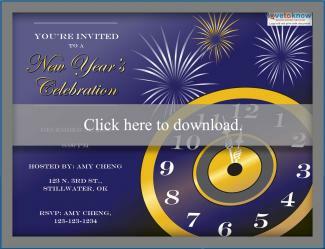 New Year's Eve is a popular time to host a party, so be sure you get your invitations mailed several weeks in advance. Your guests will be counting down the days until your party!